Just found some brilliant aerial & ground footage of Bekesbourne / Kent Flying Club from 1937 - in a couple of years time the old WW1 airfield would be picketed to stop any possible enemy landings / paratroops. You can clearly see the old RFC buildings in the foreground and along the road. Another remaining building, and the one to the left which is set back a little is original too but didn't get a photo of that! My name is Mike - I work for a television production company and I am currently doing some research on Home Defence. First of all - thanks for having me and apologies for crashing your forum. I am trying to find out a bit more about Frederick Arthur Darien Grace. I believe he flew from Bekesbourne and was part of 50 Squadron Home Defence. I would love to find out anything else about his military career and any photos. Also if anyone knows whether he has any relatives! I know he moved to Argentina after the war, so it has proved difficult to track him and any relatives down. Would be most grateful for any help you might be able to give me! You will have already seen the forums No 50 Squadron page via the link in my earlier post. It includes some information on 2nd Lieut F.A.D Grace, including the possible shooting down of a Gotha. Grace flying from Detling and Throwley rather than Bekesbourne. 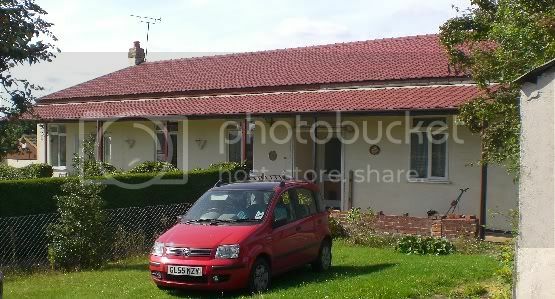 Bekesbourne was used by various Flights of No. 50 (Home Defence) Squadron RFC/RAF from September 1916 to February 1918, when the entire squadron moved in. The only other squadron to use the airfield in the 1916-19 period was No. 56 Squadron RFC, recalled from France to help defend London against daylight Gotha raids. A Flight went to Rochford, while B and C Flights went to Bekesbourne, arriving on the 21st June 1917. The only raid during the short time the squadron was at Bekesbourne was on the 4th July, against Harwick and Felixstowe. No. 56 Squadron flew 13 sorties in their SE5'S, but took off too late to intercept and patrolled well south of the bombers homeward track. The squadron returned to France on the 5th July, 1917. Two days later 22 Gothas bombed London! 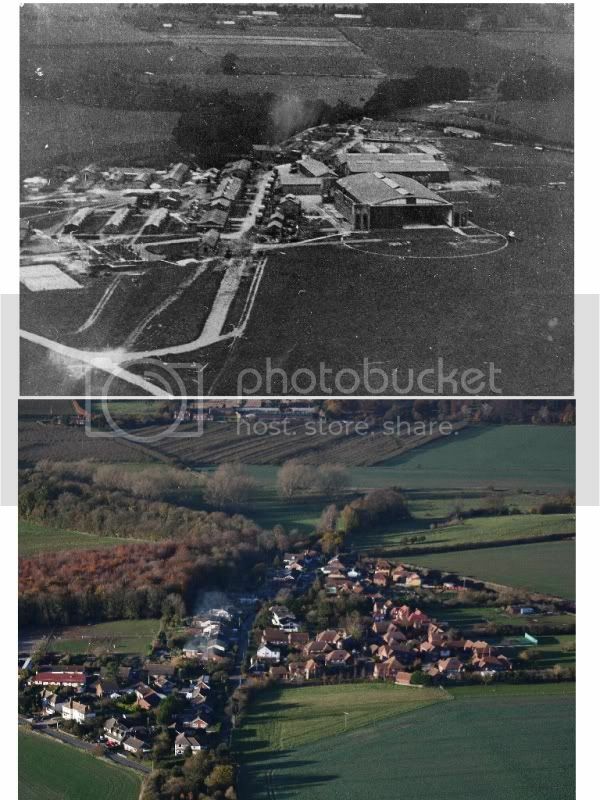 Interesting link with photos of the extant buildings at RFC Bekesbourne, although there don't appear to be any thumbnails so you have to download each photo individually. The photo in #9 may have been taken in the late 1940's.From "Kent and the Cinque Ports" by H.R.Pratt Boorman. Another pic I haven't seen - excellent thanks. Any idea what date? Another view of the airfield. 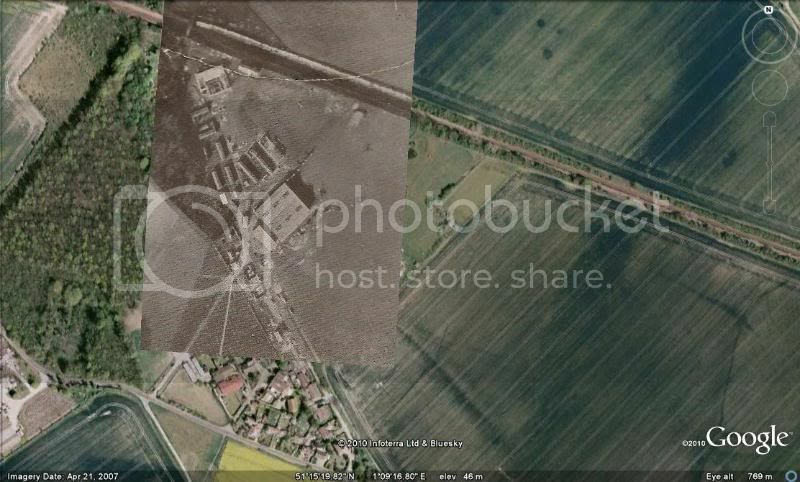 Here is a 1917 overlay of airfield buildings. You can see the wooden hangar - the large Belfast Hangar is marked out but yet to be built and quite a few of the 1918 buildings are not evident. This is dead accurate - I spent ages lining up the roads/railway line. This is an overlay of the final 1918 buildings taken from a hand drawn plan - you can see the Aerodrome Rd buildings match up pretty well with existing dwellings - not dead accurate but gives you a good idea. 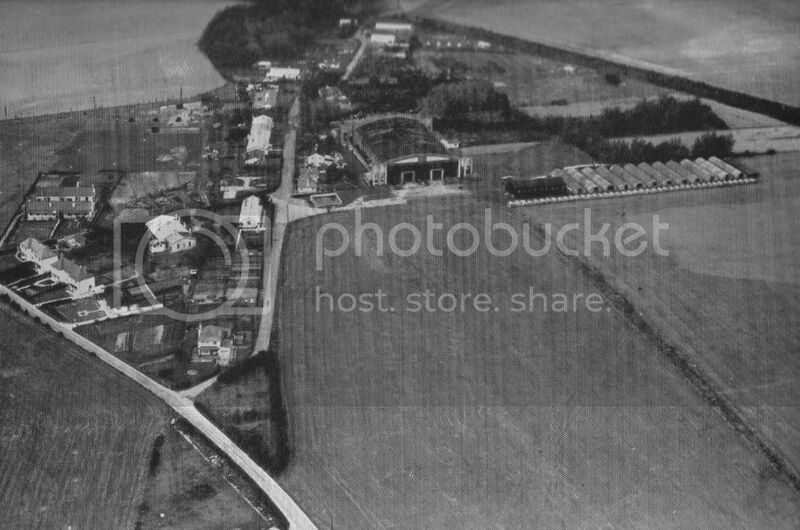 The 1918 pic is labelled Officers Mess and I'm pretty sure it is the same building as this 1980's pic and 2010 shot [can't do a full frontal now due to hedges] but it stands out well in aerial shot in previous posting. Have got a few more interesting 1918 pics of the airfield from a 50sqn booklet which I will post when I get round to it. Walking down Aerodrome road you can still pick out quite a few of the old buildings - some are still original white brick and un-rendered, many have been re-roofed, re-clad and extended. If you continue over the railway bridge you will find over 80 WW2 Dragons Teeth still in situ. Great comparison Trikeman I want to go have a look now seeing how much is still there! 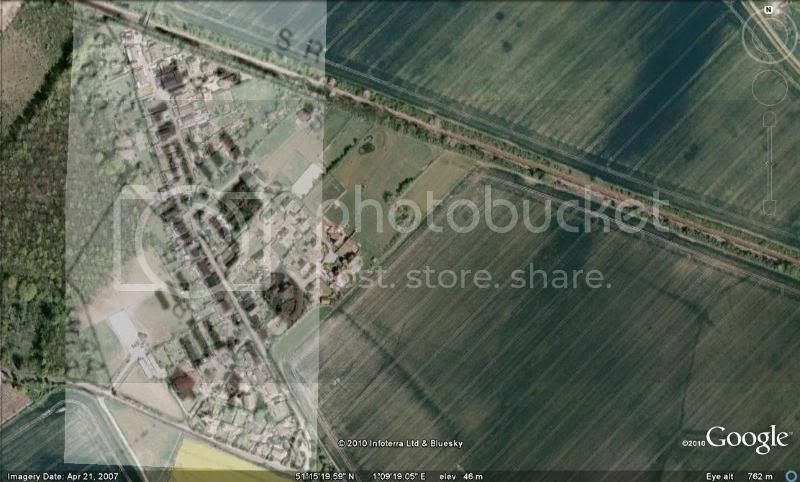 Managed to get this comparison shot recently - lines up along Aerodrome Road very nicely. 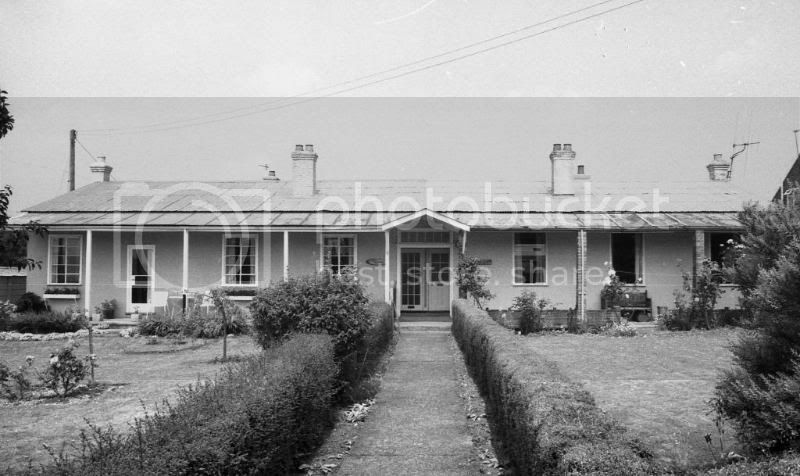 I reckon there are a good dozen of the old buildings still standing, converted to bungalows, although some have been greatly altered. Interesting to think that there might once have been an SE5a or a Sopwith Camel on what is now your patio or dining room!